December closes the 200-year anniversary of Jane Austen’s beloved Emma — so I thought I’d spend my last two posts of the year giving her a nod. It’s hard for me to believe that a story that feels so contemporary is 200 years old. In writing Dear Mr. Knightley, I studied Emma more fully and found that everything Emma encounters we do today as well – struggles with pride, friendships, understanding love, discerning character, accepting change, growing responsibilities and facing our own foibles. I think the real reason we delight in Emma, shake our heads at her and roll our eyes at times, is because we see ourselves within her. We may not control our universe, or small village, with such aplomb, but we do struggle with the emotions and the need for transformation – continually – that Emma undergoes. I recently read an article that claimed Emma was a novel about humility. I posted the article below because I think the author makes some wonderful points and you should read her words rather than my derivative thoughts on them. Also, it’s a wonderful piece about lessons learned through Austen’s novels and I always find those interesting. Austen packs a lot in each story. Back to Emma…. Waldman’s theory struck me… A novel about humility. I have to admit I hadn’t grasped that on my own. 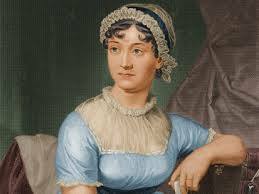 But the more I thought about it and these few lines of Emma’s self-revelation, I saw the brilliance, the truth, of her theory — and Austen’s irony in exposing Emma’s self-absorption and singular transformation by naming the novel only Emma. A mind like hers, once opening to suspicion, made rapid progress. She touched—she admitted— she acknowledged the whole truth. – Clever girl, beginning to see. With insufferable vanity had she believed herself in the secret of every body’s feelings; with unpardonable arrogance proposed to arrange every body’s destiny. She was proved to have been universally mistaken; and she had not quite done nothing—for she had done mischief. – Getting there slowly, with much drama. Emma has often been labeled Austen’s most perfect novel. It’s nuanced, layered and certainly delightful. And, as we close 200 hundred years of adoration, I think I’ll give it another read. I have to say that I really love Emma . . . the heroine and the entire novel. I think it is funny as well as having some great lessons in it. Thanks for sharing. Oh, and I meant to add that P&P is my fav, followed by Persuasion and then Emma! Emma has always been my favorite of Jane’s novels. I am quite the fan of Mr. Knightley and when I was young, I was not unlike Emma (without the fortune LOL). As I’ve gotten older, I’ve found myself to be more a mix of Lizzie and Elinor. 😉 Persuasion always frustrates the heck out of me while P&P and S&S are tied for second to Emma. That’s so fun… I have a strong Elinor streak within me too. P&P and S&S are wonderful ones. P&P has always been and remains my favorite. Emma is comical while I am moved by Anne’s story: trying to please all and yet never pleasing herself. And Capt. Wentworth’s letter is worth reading the whole book. Yes, I love that and would have wished for more of that story. Thanks for this post. That article was interesting: some strong opinions there. Yes, Wentworth’s letter is worth reading a whole novel for. Done it many times myself and even borrowed a bit for “Lizzy & Jane.” Thanks for commenting! You will love her. She make you roll your eyes occasionally, as I said, but you will adore her. Let me know. Thanks! Thanks Katherine. I’ve always enjoyed the humor in Emma and loved seeing her transformation. Fav story … sorry but I’m hopelessly stuck on P&P. Thank you so much for sharing the article. It was quite interesting. My favorite Austen story….that would be Pride and Prejudice, followed very closely by Persuasion. Northanger Abbey – one of my favorites in the movie version…JJ Feild! That girl is so naïve…at times I shutter at her behavior but in the end when he shows up, so honorably and kisses her, with her hesitation…oh, my.